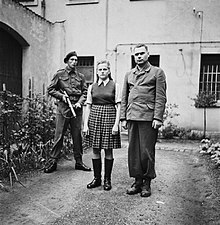 Irma Ida Ilse Grese (7 October 1923 – 13 December 1945) was a member of the Schutzstaffel (SS), a powerful Nazi military organization, during World War II. She was a guard at the Nazi concentration camps at Ravensbrück and Auschwitz. She was also the warden of the women's part of Bergen-Belsen concentration camp. Grese was nicknamed "the Hyena of Auschwitz" (German: die Hyäne von Auschwitz) by prisoners there because of the cruel ways she treated them. After World War II ended, Grese was put on trial for war crimes at the Nuremberg Trials. She was convicted of crimes against humanity for the things she did at Auschwitz and Bergen-Belsen. She was executed in 1945 at age 22. 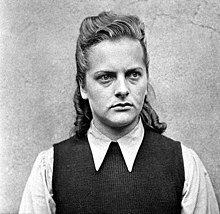 Irma Grese was born in Germany in 1923. In 1936, when Grese was 13, her mother killed herself by drinking hydrochloric acid, a poison, after finding out that her husband had an affair (a relationship with another woman). Grese's father probably joined the Nazi Party in 1937, and got married again in 1939. When she was 14, Grese quit school. By then, she was a member of the League of German Girls (Bund Deutscher Mädel), a Nazi group for girls. When British soldiers were getting close to Bergen-Belsen to liberate it (take it over and free its prisoners), Grese and some other people in the SS decided not to run away. They were captured by the British on 17 April 1945, and taken to prison. In her famous memoir called Five Chimneys, Olga Lengyel (who had been a prisoner in a camp where Grese worked) wrote about how Grese acted there. Lengyel wrote that Grese liked hurting prisoners, making them afraid of her, and choosing which ones would be killed in the gas chambers. Grese was put on trial for war crimes at the "Belsen Trial." Instead of having one big trial with hundreds of defendants, the Nuremberg Trials were separated into smaller trials. For example, people who were accused of committing crimes at Bergen-Belsen were put on trial at the Belsen Trial. Grese was tried there with 44 other people. Her trial lasted from September to November of 1945. She was given a lawyer named Major L. Cranfield. Grese was accused of treating prisoners in ways that were illegal because of an international law called the Third Geneva Convention. People who had been prisoners in the camps Grese worked at talked about how Grese murdered and tortured prisoners. They said she especially liked to hurt women. They talked about how Grese beat prisoners, let her dogs attack them, whipped them, and shot them. They said she liked to whip women's breasts, and then make the camp doctor, Gisella Perl, do surgery on the women's breasts without anesthetic, because she liked watching them suffer. On Thursday, 13 December 1945, in Hamelin Jail, Grese was executed by hanging. ↑ Barbara Möller (30 August 2014). "Die Hyäne von Auschwitz". Sie waren Mörderinnen aus Gelegenheit. DIE WELT. Retrieved 4 January 2015. ↑ Sonja Peteranderl (2014). "Der Mann, der Rudolf Höß jagte". KZ-Aufseherin Irma Grese. Die "Hyäne von Auschwitz". Spiegel Online, Hamburg, Germany. Retrieved 4 January 2015. ↑ Pierre Heumann (2013). "Hitlers Furien". Grese, die «Hyäne von Auschwitz». Die Weltwoche Magazin. Retrieved 4 January 2015. ↑ Hollander-Lafon, Magda (2013). Vier Stuckchen Brot: Ein Hymne an das Leben. Verlag. pp. 95–. ISBN 978-3-641-12709-1. Retrieved 4 January 2015. ↑ 6.0 6.1 "Oberaufseherin Irma Ilse Ida Grese". www.bergenbelsen.co.uk. ↑ Vronsky, Peter (2007). Female Serial Killers: How and Why Women Become Monsters. Penguin. p. 383. ISBN 978-1-101-20569-3. ↑ Celinscak, Mark (2015). Distance from the Belsen Heap: Allied Forces and the Liberation of a Concentration Camp. Toronto: University of Toronto Press. ISBN 978-1-4426-1570-0. ↑ Lengyel, Olga (1995). Five Chimneys. Academy Chicago. pp. 001–231. ISBN 978-0-89733-376-4. ↑ "Excerpts from The Belsen Trial (5/5)". Nizkor.org. Retrieved 2011-06-07.